Free Shipping Included! Willow Picnic Basket from Picnic and Beyond by Picnic & Beyond at COTM Blog. MPN: PB1-3553B. Hurry! Limited time offer. Offer valid only while supplies last. Robust details and luxury appointments enhance this versatile, affordable Picnic Basket. Serves four picnickers with flatware, plates and glasses. 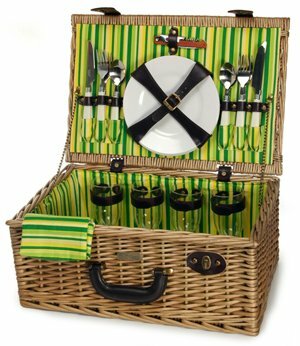 Robust details and luxury appointments enhance this versatile, affordable Picnic Basket. Serves four picnickers with flatware, plates and glasses. You'll also get an opener, napkins and leatherette interior appointments. Sturdy wood - wicker construction is built for the long haul. From Picnic & Beyond. Willow picnic basket for four. Content: 4 sets of flatware with white plastic handle, 4 melamine plates, 4 glasses, 1 opener, 4 napkins. 18.11 in. x 12.21 in. x 8.67 in.. Weight: 6.68 lbs..
18.11 in. x 12.21 in. x 8.67 in. If you have any questions about this product by Picnic & Beyond, contact us by completing and submitting the form below. If you are looking for a specif part number, please include it with your message.